West Kilbride is a small North Ayrshire town which stands on rising ground east of the main A78 road as it runs along the eastern shore of the Firth of Clyde. The town's coastal continuation, Seamill, is bisected by the main road, but West Kilbride itself has an oddly elusive quality: you need to actively seek it out, and the temptation is to simply stay on the coast road and pass it by. Do so and you miss a fascinating place that is full of character, and equally full of topography. This is a town which makes full use of the third dimension to add interest, apparently being built on a series of ridges running parallel to the higher ground to the east. As a result the Main Road, which runs roughly from south west to north east, drops and rises significantly. If nothing else this certainly provides some great photo opportunities, especially in the centre of the town where the Main Road crosses the line of what would originally have been a valley. 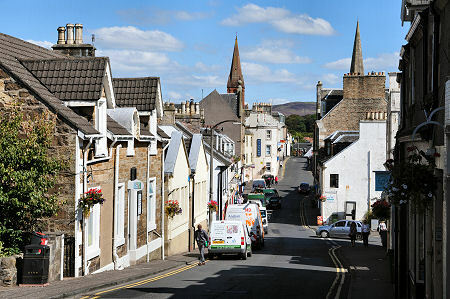 In recent years West Kilbride has made a name for itself, and provided additional reasons to turn off the A78, as "West Kilbride Craft Town", Scotland's only designated craft town. The focus for this is the Barony Centre, converted from what was previously the Barony Church in 2010-12 and overlooking the eastern end of the Main Street. The Barony Centre comes complete with exhibition space and a gallery shop, and a range of complementary creative activities, plus classes for craftspeople of all abilities. But the idea of a Craft Town goes far beyond having an appropriately themed community hub at its heart. 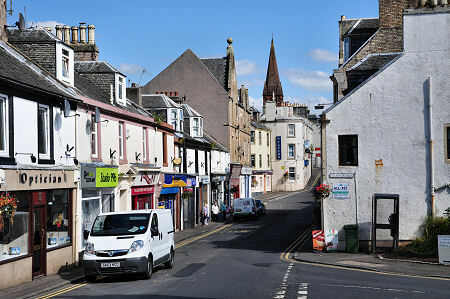 West Kilbride is also home to a growing number of Craft Studios, eight at the time of our visit, dotted around the town. Here you can view the work, and buy the products, of craftsmen and women working in silver; painted yarns; stained glass; cards; textiles; teddy bears and much more. The effect is to give a point of focus for the town, and the result appears to be to add significantly to the commercial activity along Main Street, ensuring that a range of other commercial and retail businesses remain viable which otherwise might not. West Kilbride has other attractions for the visitor. 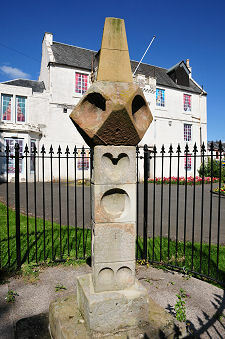 Towards the western end of Main Street is the very attractive village hall, which is home to West Kilbride's successful museum. A short walk up Halfway Street is the town's fine looking modern library. Having said that, there remains obvious evidence that the regeneration of West Kilbride still has some way to go. The Kilbride Tavern is an imposing building whose size and location means it dominates views along the central section of Main Street. These views would be greatly improved if the tavern could be given a fresh coat of paint. Perhaps even more important to the town is the future of Kirktonhall, which stands on the south side of Main Street. This fine and extensive three storey house was originally built in 1660, before being refurbished and extended in 1791 and 1868. It has most recently served as offices for North Ayrshire Council, but now stands disused and boarded up. Having said that, the lengths someone has gone to to paint scenes of interior life onto the boards over the windows bodes well for the future. And it is good to hear that the Kirktonhall Creative Media Group is working to give the building a new life and providing training and facilities in digital media. Kirktonhall was originally built by Robert Simpson. Local legend has it that he financed the building of the house with treasure that one of his daughters had found buried on his property. The circumstances of the find and the nature of the treasure appear to go unrecorded by history, so this must remain one of those attractive stories that might or might not have a foundation in reality. In 1687 a better known Robert Simpson (and the grandson of his namesake?) became West Kilbride's most famous son when he was born in the house. He went on to become Professor of Mathematics at Glasgow University in 1712, and is commemorated by a large monument in the town cemetery. The origins of West Kilbride might (or might not) date back to the establishment here of an early place of worship dedicated to St Bride. Law Castle was built to the east, on the slopes of Law Hill, in 1468, and Portencross Castle had been built on the coast two miles to the west in the 1300s, but it seems that when Kirktonhall was first built there was at most a very small village here. By the early 1800s the village had become a centre for handloom weaving, and a post office opened in 1838. It was not until the arrival of the railway in 1878 that West Kilbride began to grow into the village you see today.